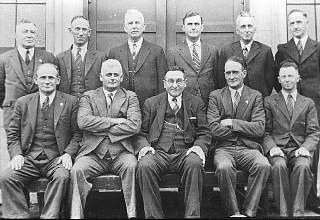 Back (left to right) : Messrs, J. Harris, E. Deutscher, H. R. Mallett, R. McFarlane, H. Larter & E. E. Cox. Front (left to right) : Cr. K. D. Lane, Cr. H. D. Mitchell, Mr. C. Coulson (President), Cr. H. J. Northcott & Mr. L. Miller (Secretary).